Mini Haul! 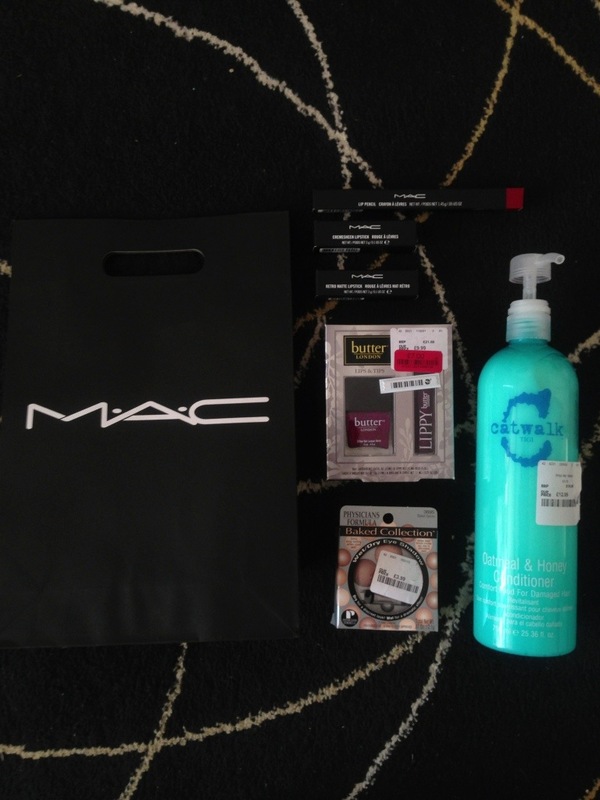 : MAC & TK Maxx | Becky Alyssa's Beauty Box. Over the last week I’ve been celebrating the end of my jury duty (yay!) – it’s great to finally have some free time & start making plans for summer. Since then I’ve been shopping & picked up a few things that I just couldn’t say no to..
MAC goodies! Normally I don’t buy from MAC as their products can be so expensive, but I paid a visit to their Bournemouth concession on a quiet Friday afternoon to browse & have a play with some of the makeup. I’ve been particularly into lip products lately but didn’t think any lipstick would suit me due to my colouring and red hair – usually I stick to natural pinks and subtle shimmery balms and glosses. After a quick consultation with a very lovely sales assistant, she picked out a few shades for me, all products I would NEVER pick myself because I’m so used to choosing very natural colours. She let me try each one on and I was so surprised at how well they all suited me. I ended up going for lipstick in Ruby Woo, the loveliest brightest retro matte red with a lip pencil in Cherry which gives the lipstick serious wear time and applies so smoothly – these two products are must-haves for the perfectly defined classic red lip, but I’m saving them for evenings out as they’re a little bright to wear during the day! I also picked up another lipstick in Ravishing, a gorgeous pinky-coral in a lovely cream formula. I’ve been wearing it for the last few days – it’s perfect for everyday wear and you can build it up from a sheer coverage or apply more for a brighter, more opaque colour – I’m in love & can’t wait to pick up some more! Butter London gift set, £7 I’ve been wanting to try Butter London polishes for a while but I’m reluctant to pay over £10 for a single nail polish. However I spotted this sparkly hot pink I’ve had on my wishlist for a while, reduced to £7 and comes with a matching lip gloss – bonus! I’m not into glittery lips so I’ll swap this, but I’m thrilled to have got my hands on this polish for a slightly more reasonable price. Physician’s Formula Baked Palette, £3.99 I love a good neutral eyeshadow palette and had to pick up this American import for just under £4. I’ve yet to use it, but their mosaic compact powders have performed wonderfully for me in the past so I’m hoping this will work just as well. Catwalk Oatmeal & Honey Conditioner, £12.99 This conditioner smells like childhood to me, this used to be my favourite until it got discontinued. TK Maxx is perfect for picking up old stock and I can’t wait to start using this again, it smells incredible & people always used to comment on the delicious scent when I’d used it. Apparently Tigi are bringing back a new line of reformulated products in this scent very soon so I’ll undoubtedly be buying all of them! 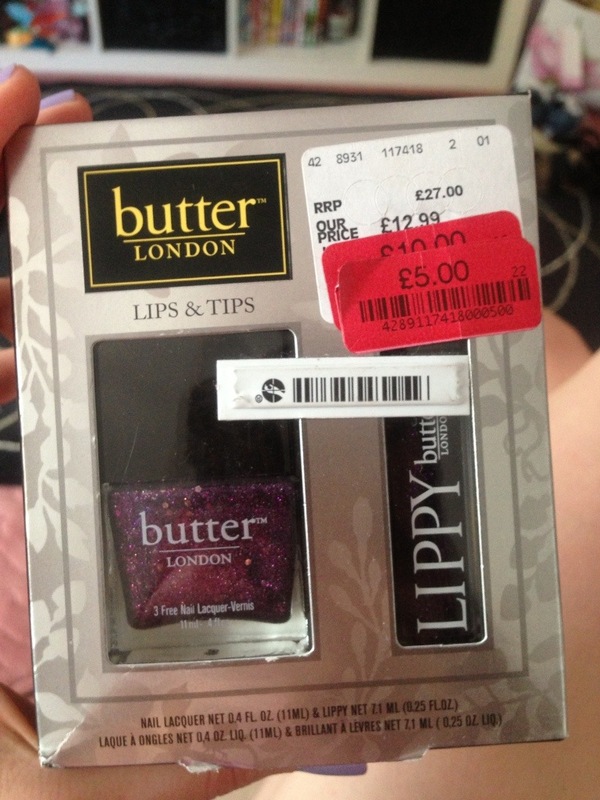 I also found another Butter London polish set for just £5, got to love a good deal! Especially when they’re so expensive new! This week I’ve definitely done quite well, I’ll certainly be getting my hands on a few more MAC lipsticks in the near future & will be checking out the delicious new Tigi Catwalk collection when it’s released. Any other MAC lipstick lovers – which are your favourites? This entry was posted in Uncategorized and tagged mini haul. Bookmark the permalink.